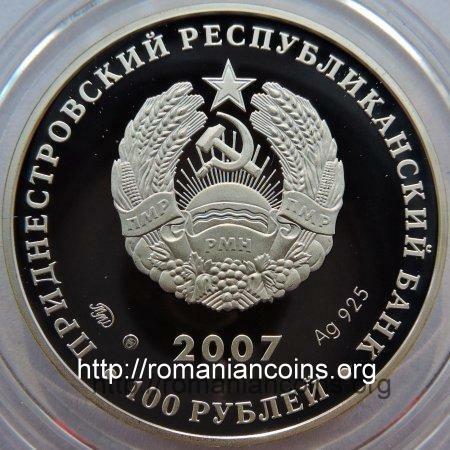 Obverse: denomination "100 RUBLEI" (Cyrillic), coat of arms of the self proclaimed republic of Transnistria (bearing hammer and sickle), inscription "PRIDNESTROVSKII RESPUBLIKANSKII BANK" (in Cyrillic and Russian) meaning "[TRANS] NISTRIAN REPUBLICAN BANK", year 2007, at left mintmarks, at right Ag 925, the silver fineness Reverse: a picture of the field marshal, next the coat of arms of the Russian Empire and, on a sheet of paper, a map with Nistru River and with the cities of Dubăsari, Grigoriopol, Tiraspol and Tighina (Bender), inscription "GRAF RUMYANTSEV-ZADUNAISKY", years 1725-1796 and, on a ribbon, "ROSSIYA V ISTORII PRIDNESTROVYA", meaning "COUNT RUMYANTSEV-ZADUNAISKY" and "RUSSIA IN THE HISTORY OF (TRANS)NISTRIA"
The coin belongs to a series named "Russia in the history of (Trans)Nistria". The series also comprises the 100 rubles 2007 coins with field marshal Grigory Potyomkin and with general in chief Piotr Panin, the 100 rubles 2008 coin with field marshal Peter Wittgenstein and a 5 rubles coin from 2009 with Russian Empress Catherine II. Count Pyotr Aleksandrovich Rumyantsev - Zadunaisky (1725 - 1796) was field marshal of the Russian army and governor of Ukraine. During the first Russo-Turkish War from 1768 - 1774 he captured the fortress of Azov (6th of March 1769) and defeated the Turks at Larga and Cahul, later his army crossing the Danube River. For this achievement he was rewarded in 1774, with the surname Zadunaisky, literally meaning "from over the Danube". He is considered one of the greatest Russian military commanders. Accordingly to Rumyantsev's biographies written in Russian on the Internet, the future field marshal was born at Moscow. In Transnistria Rumyantsev is considered to be born at Stroieşti, on Nistru River, near Rîbniţa. 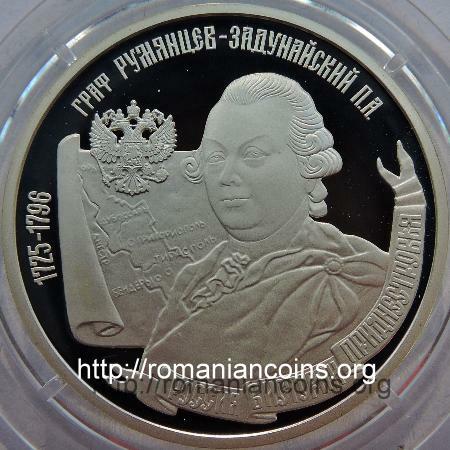 Rumyantsev was involved in the operation of issuing bronze coins of 1 para and of 2 paras at Sadagura Mint by baron Gartenberg, in 1771-1774. The issuing of bronze coins for Moldavia and Walachia caused great losses for the economy of the Romanian principalities. Field marshal Rumyantsev is represented on the 200 roubles 2006 Transnistrian bancnote.